Digital Marketing is a rapidly progressing phenomenon, to reap the rewards, you need to move towards digital technology and communicate your brand. Digital Marketing is an evolution of modern technologies that is important for small, medium or large businesses. 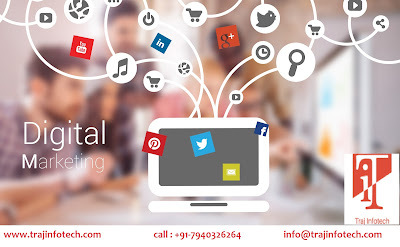 Digital Marketing is a strategy that is the best way to reach out to potential customers and attract their attention towards your brand or business. Many people use internet to search for products and services. Online marketing makes it easier for prospective buyers to find your brand. Online marketing engages your prospective customer in a conversation, creating a relationship of trust; customers usually purchase products on the basis of trust. Digital Marketing is a powerful tool that has the ability to converse with potential buyers. It enables you to interact with the targeted audience, interacting with customers, will help you understand the expectations of your targeted audience. This information is useful to make the right strategies to improve customer experience and build brand loyalty. It is important to select the right strategy that will benefit your brand or business. The digital marketer needs to use innovative and smart strategies to convert visitors to customers. Digital Marketing Service enables small and medium companies to compete with large organizations. It provides resources to companies for them to market and sell their products or services to customers from around the globe. With the rapid rise in mobile users, digital marketing focused on mobile users will help the growth of your business, by winning over potential customers. The success of your brand or business is measured by the number of conversions. Need to know the percentage of incoming traffic that gets converted into sales. The tools and methods that improve digital marketing campaign are email marketing, social media marketing and search engine optimization. If you’re business delivers what it promises, you will be able to share a good relationship with your audience, and this will build the reputation of your brand. A good campaign helps high conversion that leads to higher sales and revenue. Digital marketing improves your branding and increases your revenue. A steady flow of traffic that leads to conversion is the key to success. A successful Digital Marketing strategy will either let your business swim or sink, will help your business either to succeed or fail. Large number of visitors and less number of conversions, this is why digital marketing is required, it offers strategies to attract the targeted audience and deliver the desired results. For more Information about Digital Marketing Services visit our website Traj InfoTech Pvt Ltd an IT Service Provider Company in Ahmedabad.